I have had a great day and all of it was rather unplanned. I unexpectedly caught up with a friend Gail that I met at a workshop a few years ago. I was reading my e-mails and there popped up an e-mail from Gail. I decided to call her and we had great conversation. As much as I appreciate blogs and e-mails, it was a real treat to have a conversation with her. She had another piece accepted ! This time it will be a piece at Fiber TwentyTen in April. I spoke with her as I was driving to have lunch with my daughter Erin who is madly studying away at college. (She had a cold and was desperate for some cookies and cold medicine.) Another great conversation and unexpected time that I shared with her. She had too much homework to come home this weekend but it will be great to have her home next weekend for spring break. 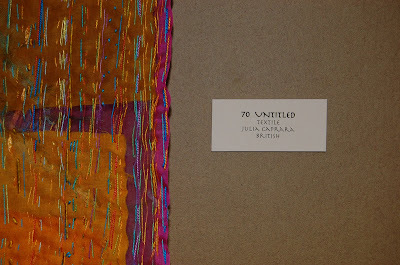 And the third unexpected treat I had this past week was a trip to a local fiber arts exhibit. I have been dying to find a way into this building. It was renovated last year with a grant- a “green” grant and I have always enjoyed the architecture of this previous orphanage. 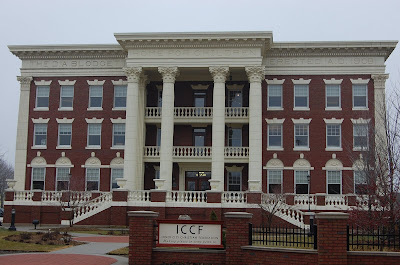 You can read about it here at ICCF website-they provide affordable housing for low income families. This was an amazing building and everything has been renovated back to original splendor. I was drooling over the woodwork. Wow. Back to the exhibit- Fabric of Our Lives is a textile arts exhibit from the private collection of Roberta Green Ahmanson. And what a private collection it was of quilts, lace, molas, cloth sculptures, and Hmong embroidery. I was allowed to take pictures but most of it was in window shadow boxes and I kept getting a glare off the glass. I think if you click on the website you have a much better representation of this wonderful art. If you live locally, run to this exhibit before it is gone . It is easily accessible as it has an elevator within the building. This was my favorite- a large piece from Julie Caprara. If I show you too much, you won’t go! This was a treat and privilege to see. Run, girls, run! Go be spontaneous and get in the car to see this exhibit. Yes, I am finishing baby quilts and I think i might end up with 5! 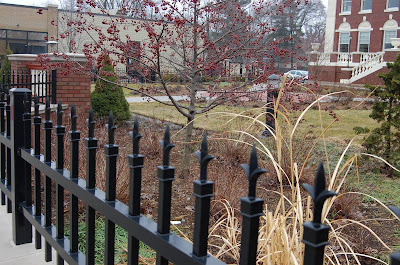 This entry was posted in Julie Caprara on March 12, 2010 by Colleen Kole.